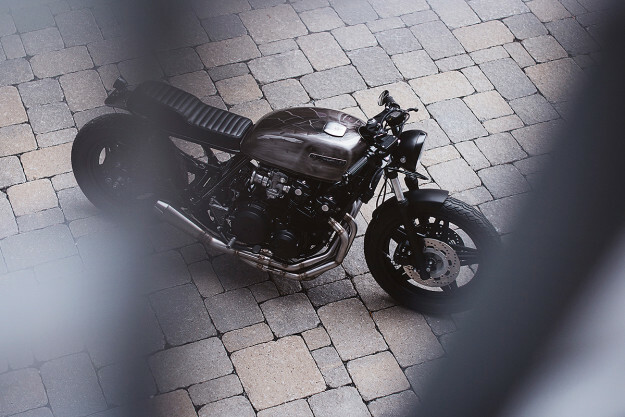 The CB900 Custom is one of the strangest motorcycles Honda has ever made. 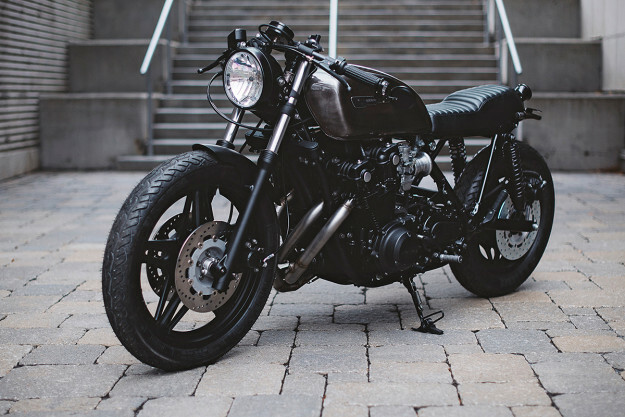 It has shaft-drive, an enormous 62-inch wheelbase, and a ten-speed transmission. In stock form, it’s a humdrum cruiser. 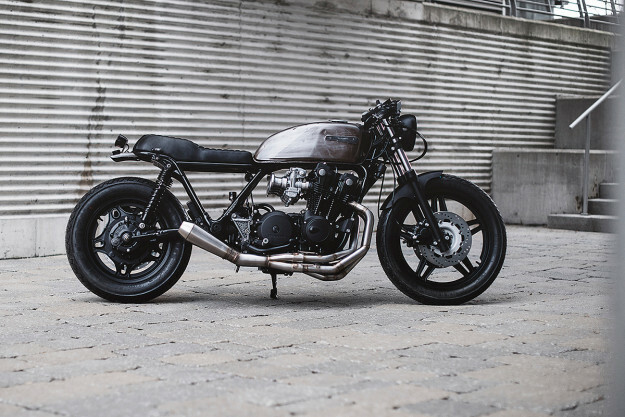 But you’d never guess from this stunning build by Clockwork Motorcycles. 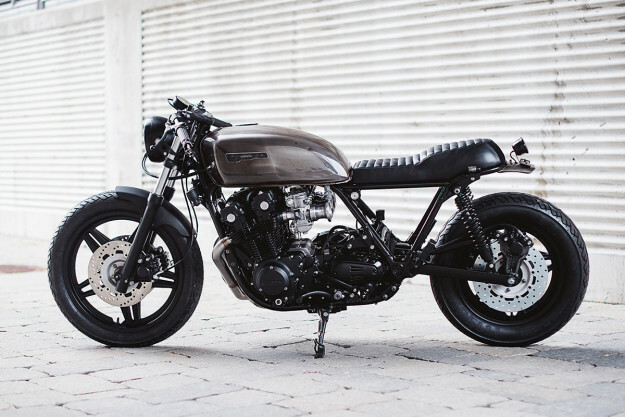 This CB belongs to a motorcycle enthusiast who picked up the 1981-spec bike on the cheap. After a couple of months, he booked it into the Montréal workshop. Yes, you read that right: ten speeds. 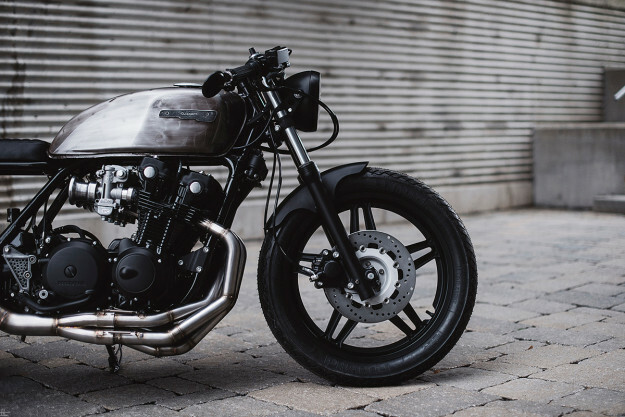 Honda’s super-long ‘factory custom’ was a parts bin special, matching the Euro-spec CB900F engine to the GL1100 final drive unit. To connect the two, Honda used a pair of cross shafts—and turned them into a two-speed ‘Select Range’ secondary transmission, much like the high and low range on a 4WD vehicle. Perfecting the stance proved to be a considerable task. Samuel lowered the front forks by a whopping four inches, and binned the soft stock air shocks. The bike now runs on longer, sportier Progressive Suspension units. Samuel has brought the electrics up to date with a Motogadget M-unit and a Lithium-ion battery. 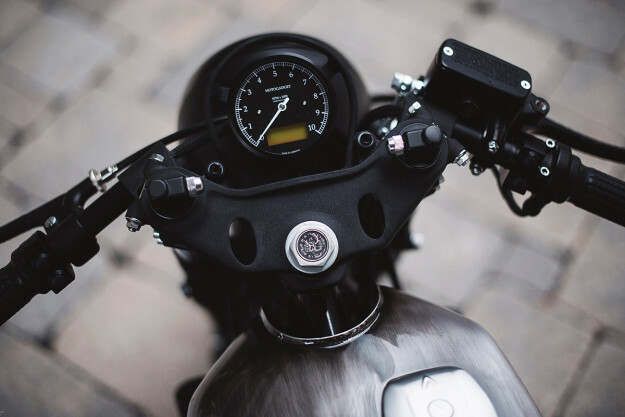 The Motogadget-ry extends to the cockpit too—with a speedo, grips, switches and bar-end turn signals. With the tank mounted, Samuel lopped off and rebuilt the subframe, and made up a new seat pan. Ginger McCabe at New Church Moto handled the leather and suede upholstery. 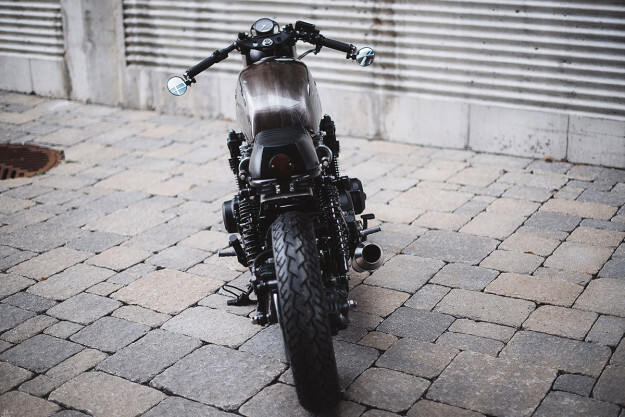 “I decided to go with a bulky seat to fit the fat engine and size of the bike,” says Samuel. The ‘fat’ engine received some love too. The quirky ten-speed box is still there, but the engine itself was bored out to 985cc with a Wiseco kit. Further additions include Keihin CR31 carbs—kitted with custom-made aluminum velocity stacks from Prism Motorcycles, and tuned to perfection. And then there’s the exquisite, stainless steel four-into-one exhaust. The wheels are the originals, but now refinished in black. The brakes are stock too—but they’ve been upgraded with stainless steel lines and drilled EBC discs. Pirelli MT66 rubber, designed for tourers and cruisers, was picked for its combination of looks and grip. 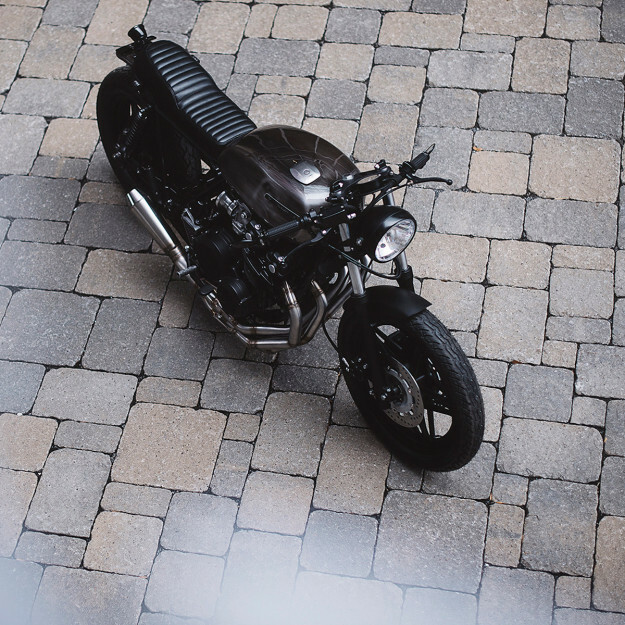 A unique bike deserves unique finishes, and Guertin hasn’t disappointed. 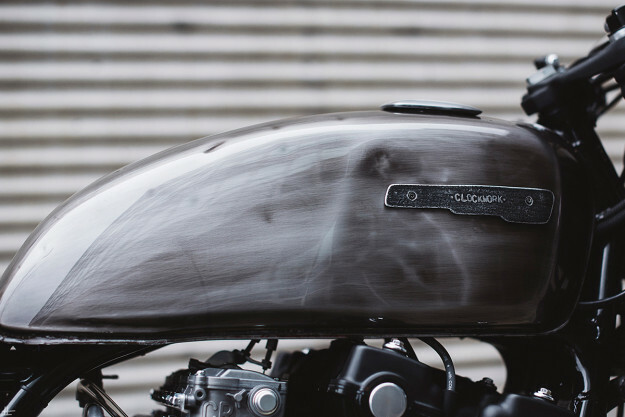 He’s given the tank and rear fender a raw-brushed, blackened and clear-coated finish. Just about everything else has been blacked out. 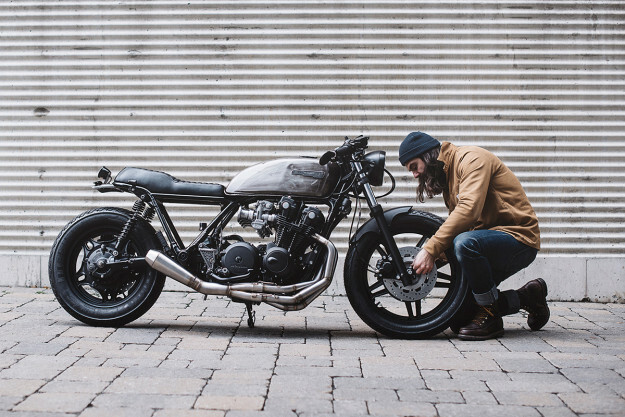 Clockwork’s last build was a CB750 that made it into our annual Top 10. Good to see M. Guertin maintaining the high standards.